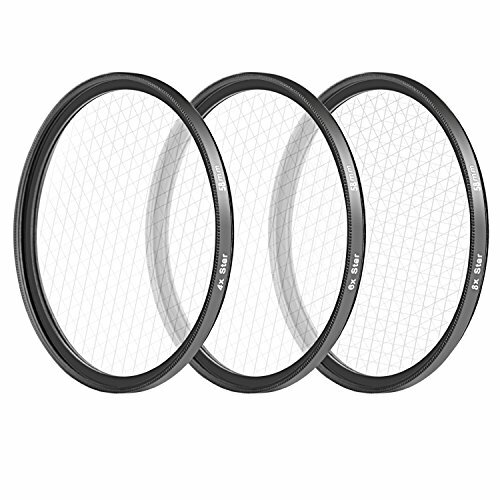 The 58MM 3-Pack Star Filter kit is used for Canon Nikon cameras to produce star-like effect to gemstones, diamond, jewelries, glassworks and lights at night, add elegant touch to photos and video projects when Photoshop is unavailable. The star pattern is generated by a very fine diffraction grating embedded in the filter, or sometimes by the use of prisms in the filter. They are made of high definition glass for razor sharp images and videos and have lightweight aluminum frame for easy installation and removal. The magic filter helps creates a star pattern, translate brightness of the sun, blinks of light on the water, reflections, etc. into a culturally readable image, add some sparkle to your night shots, city skylines, street scenes, lamp posts, streetlights, car headlights, candle lights, and gaslights, any place there's sources of points of light. They emphasizes glaring sunshine reflected by the sea and bring brilliant atmosphere to night scenery. 6 Points and 8 Points Star Filters can generate longer beams with a lens with longer focal distance. The filters can also be used in combination with other filters for remarkably creative effects. The Filter Carrying Pouch is designed to hold and protect filters with or without their protective cases. The Microfiber Cleaning Cloth features special saw tooth pattern edges; Leave zero scratches, streaks or marks.